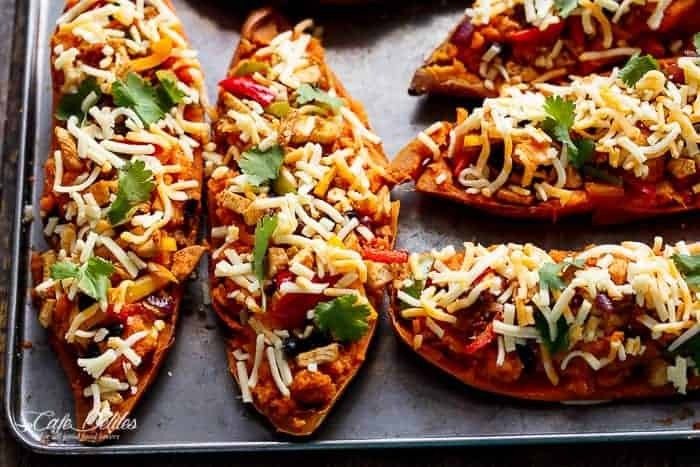 Merging two favourites into one delectable parcel, these Chicken Fajita Sweet Potatoes are a deliciously creamy way to change a meal from boring to fiesta! 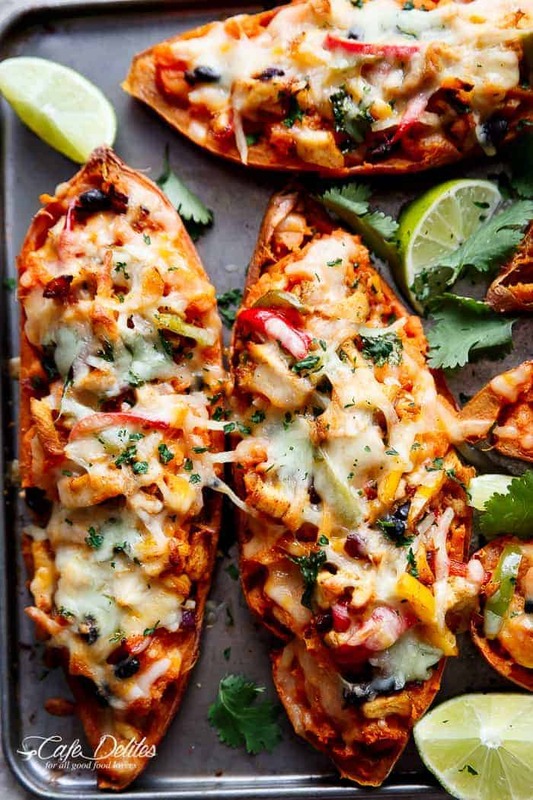 Okay, so that sounded as cheesy as these are in cheese, but it’s the only way to best describe the flavour in these Chicken Fajita stuffed Sweet Potatoes. 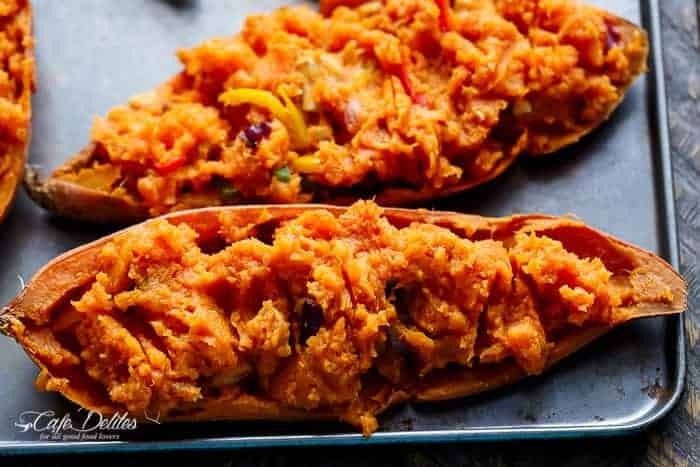 Healthy and filling comfort food in the form of sweet potatoes stuffed with a chicken fajita filling. I cannot begin to tell you how amazing these are. Or were, as the case may be. Especially only being 206 calories each! Simple to make; no chef skills required. Just good-sized sweet potatoes and an oven. 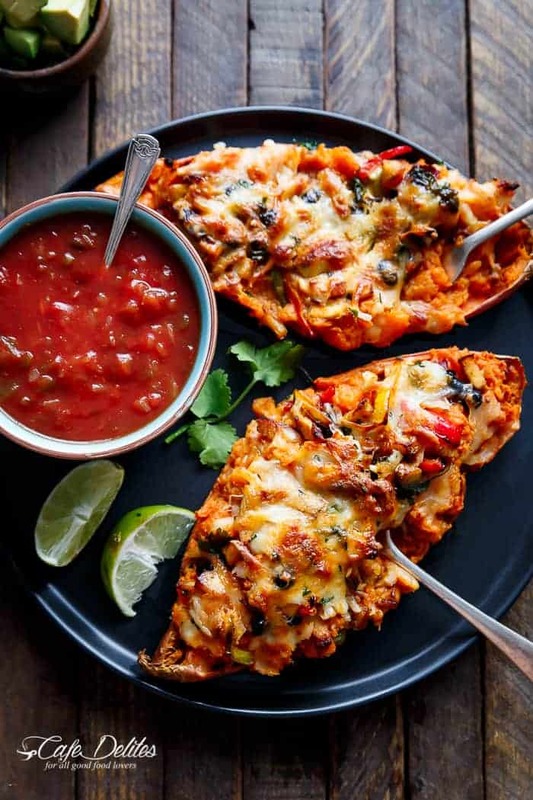 This recipe is so versatile, it’s a no fail situation using raw or cooked chicken breast, peppers (capsicums) of all colours, some red onion, and tex-mex inspired flavours. With a quicker 20-minute version, or a slower ‘hour and 15 minutes’ version, these taters will fast become a family favourite! Roast (or microwave) your sweet potatoes. Scoop out the flesh, mix it up with your fajita filling, and stuff em back the way they were. Or, sort of how they were. And back into your oven to melt that cheese. All of the ingredients and the flavours start a party in your mouth, the kind with pistols firing in the air. Top these Chicken Fajita Sweet Potatoes with cubed Avocado and some chopped cilantro (coriander) and drizzle with lime juice! And finally, serve with your favourite salsa dip. However, my favourite part is watching the cheese pull. Ah yes. Cheesy cheese pull. 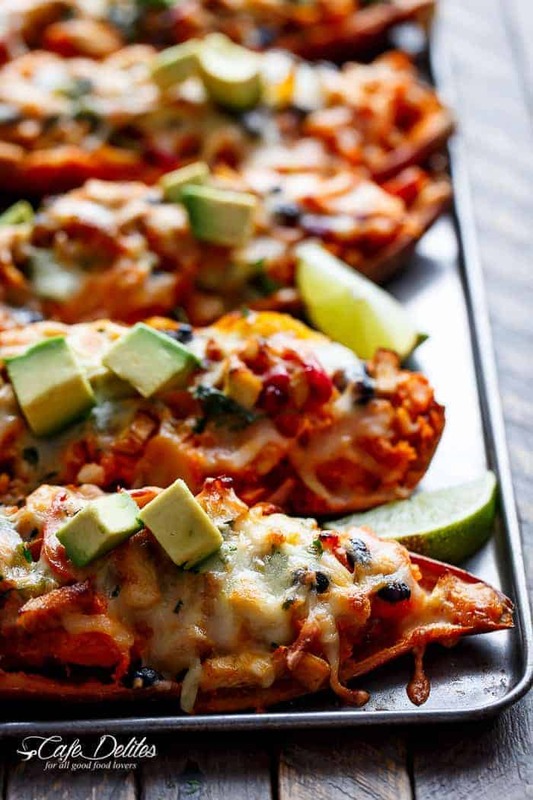 And when you’re done with these Chicken Fajita Sweet Potatoes, try these Cheesy Bacon Bolognese Stuffed Sweet Potatoes. Or have the ultimate breakfast in tex-mex style with a Huevos Rancheros Tortizza! 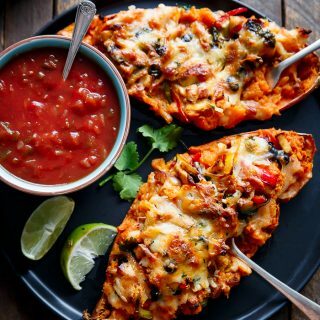 Chicken Fajita Sweet Potatoes | Healthy and filling comfort food and a deliciously creamy way to change a meal from boring to fiesta! Wrap sweet potatoes in one piece of paper towel. Microwave on high settings for 10 minutes. Remove carefully from microwave and unwrap (being careful of the steam that will escape from inside the paper towels). Pierce all over with a fork, wrap again and microwave for a further 14-15 minutes until soft (if the centres are still a little hard, don't worry they will continue to cook in the oven later). Preheat oven to 220°C | 430°F. Spray a baking tray/sheet with nonstick spray and arrange sweet potatoes the tray. Roast for one hour in the oven, or until soft (check them after 40 minutes, pierce with a fork, and continue roasting if needed). Remove the sweet potatoes from the oven; allow them to cool for about 5 minutes until they are just warm enough to handle (not until they're completely cold); and carefully slice them in half. Slice around the inside of the skin, leaving 1cm 'wall' around the inside of the skin. Slice small cubes into the flesh for easier removal. Scoop out the flesh and transfer it into a medium-sized mixing bowl. Set the skins aside. 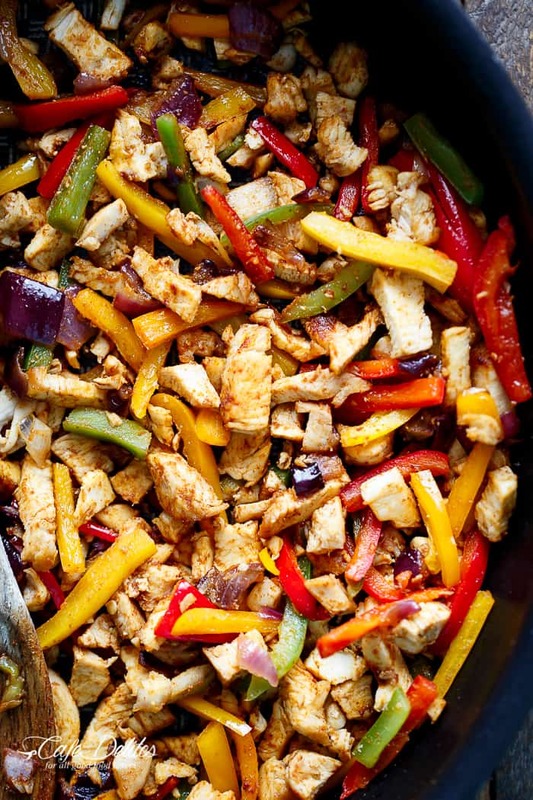 Add the chicken fajita mixture to the flesh in the bowl; mix it through until completely combined. Stir in the lime juice. 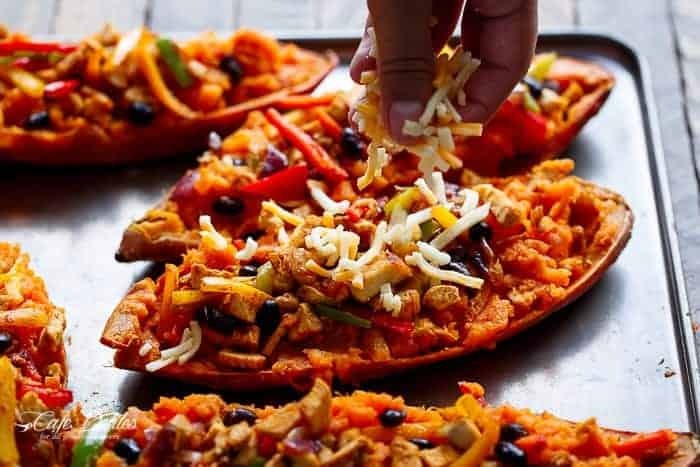 Arrange the skins on the same baking tray/sheet, and stuff them with the fajita sweet potato mixture. Sprinkle with cheese and the coriander/cilantro leaves. Put them back into the oven for 15-20 minutes until cheese is bubbling and starting to brown (or place under the grill/broiler in the oven for golden, crispy cheese for 10 minutes). Serve with any left over coriander/cilantro leaves, lime wedges, avocado pieces and smother in salsa dip. Absolutely delicious. We put a bit of sour cream on top. I will make this again. exactly how many grams is a medium sweet potato? native sweet potatoes here in the philippines are a lot smaller. thanks!! I like to use myfitnesspal.com to look up any nutritional questions I may have. Hope that helps! Thank you for following along with me from the Philippines!! I see it is 206 calories per serving. Is a serving for a half or a whole sweet potato? Yes, that is for a half of a sweet potato. Hope that helps! If you have any other nutritional questions I like to use myfitnesspal.com. Where has the recipe gone? This recipe sounds delicious! Except I dont have a microwave, any recommendations? Could I just put them in the oven on a lower temperature for the same amount of time the recipe calls to put it in the microwave? Yes, that sounds fantastic! Great idea and way to improvise! Thanks so much for following along with me! I had a large Mexican themed dinner party and on the buffet I included these stuffed sweet potatoes and the avacado/corn/tomato salad found on Cafe Delites. Both were excellent and I received raves from my guests. I made these sweet potatoes ahead of time and baked them just until hot and bubbly. To keep the chicken from drying out, I browned the chicken but didn’t finish cooking them in the assembly stage. As they reheated, they finished cooking and the chicken remained moist. Made all the salad ahead of time except for the avacado and lettuce, which I added right before serving. Love Cafe Delights and the wonderful recipes. I like the combination of sweet potatoes with chicken it matches so well. 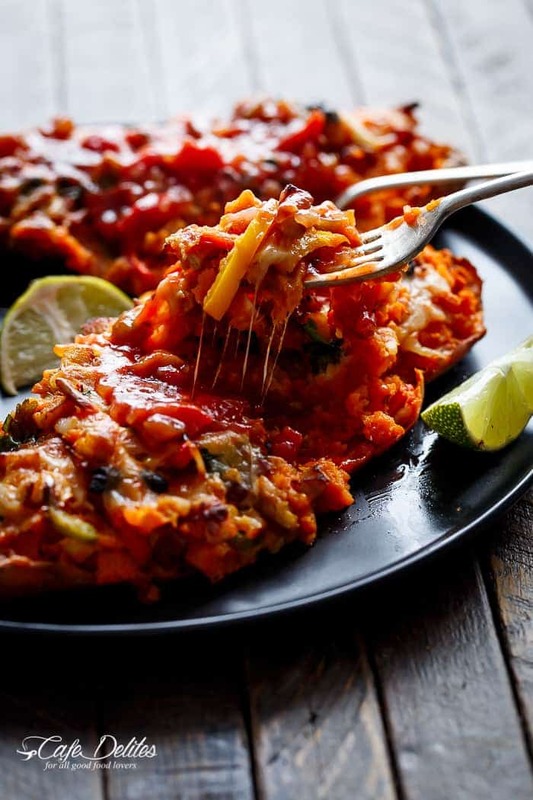 Thank you for sharing this amazing recipe with us. Thanks Boyan! And you’re welcome! If my family hates sweet potatoe. What else can I use? Have you tried freezing them? Just wondering if I could make and freeze them for a quick meal! No I haven’t Amanda, but you can certainly try! I’d imagine freezing them in batches wouldn’t hurt at all! These looks amazing! 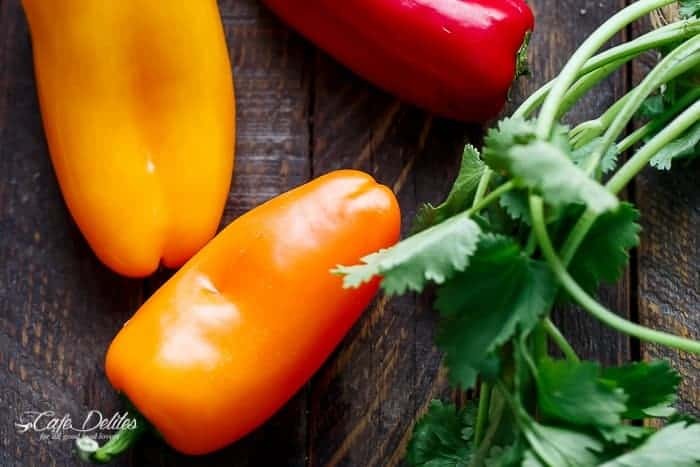 I’ll be adding them to my meal plan – thanks for sharing! 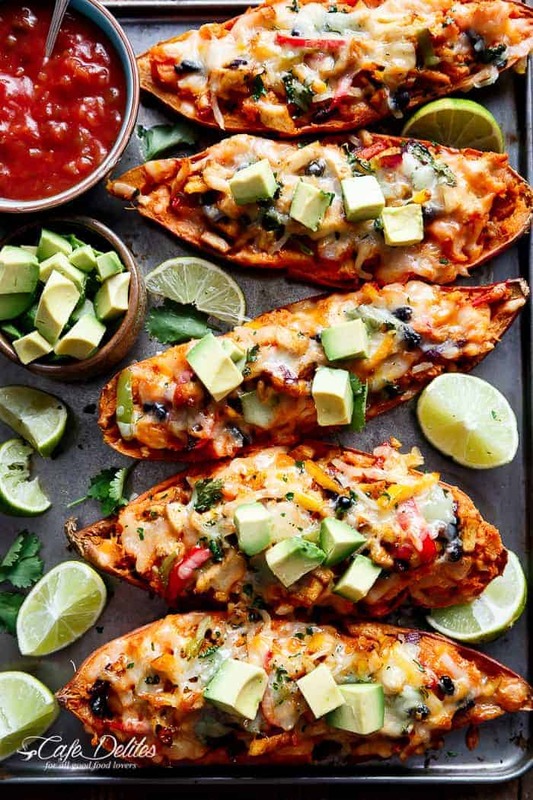 My husband is on a sweet potatoes kick and I bet he would love this! We love making new things on the weekend. I think I will surprise him with this recipe. Thanks for posting! You’re welcome 🙂 I hope he enjoys it! Must be something in the water! I just peaked at yours and they look delicious! “Party in your mouth” I’m down with that!! Anything with this much cheese is okay by me. Looks amazing Karina! Gorgeous as usual! !